When the gods holler, the skies open up. Such is the milieu of monstrous mayhem and diabolic allegiances that courses through the veins of this earthy robust and homespun film about the coal mafia in Dhanbad. Frankly what you see is what you get here.. nothing more nothing less! 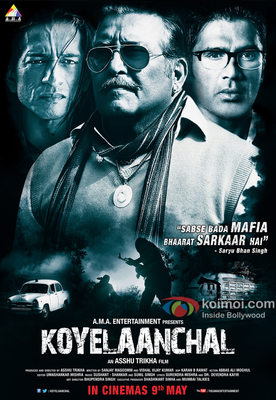 Koyelaanchal(meaning Coal Belt), is the story of a mafia lord Saryu Bhan Singh(Vinod Khanna) , the uncrowned king of Rajapur, a ravaged coal town, whose inhabitants have death haunting them from twin forces. The ever burning coal fields with black soot permeating the air they breath and consequently causing severe lung infections on one hand and on the other hand, there's Saryu Bhan Singh's adopted son, the lethal killer Karua(Vipinno) who doesn't need much prodding from his master to annihilate all opposition. Into this scenario is thrown in a righteous District Collector(Suneil Shetty) who wants to change the prevailing status quo but gets hampered by a near lethal attack on his family. The IB is called in to salvage the situation but Saryu Bhan Singh is indomitable and Karua, totally unhinged. So nothing goes as planned especially since the collector's son is under Karua's forced protection. Coal mafia Saryu Bhan Singh (Vinod Khanna) is the uncrownd king of Rajapur. He removes every obstacle that comes his way, mercilessly. He runs his empire on fear and weapons. Marred by a bad script and lacklustre production value, this one is worth giving a skip.